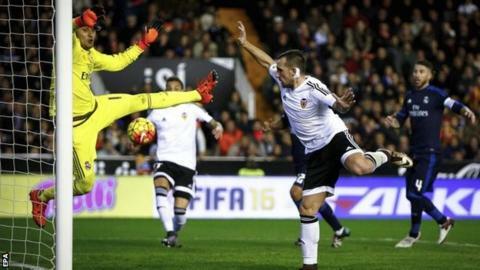 Gary Neville's Valencia battled to a dramatic La Liga draw with 10-man Real Madrid at the Mestalla. The visitors led when Karim Benzema finished off a great move involving Cristiano Ronaldo and Gareth Bale, but Dani Parejo equalised with a penalty. Real had Mateo Kovacic sent off for a lunging tackle but looked set for a win when Bale headed home. However, Valencia earned a third point under Neville when Paco Alcacer headed in from close range seconds later. The home side could have won the game in injury time when substitute Alvaro Negredo was found in space at the edge of the box, but he could only shoot straight at goalkeeper Keylor Navas. There is no doubt this is the best result of Neville's spell as Valencia boss, following a Champions League defeat, two draws from three La Liga games and a Spanish Cup win over lower league Barakaldo. Los Che did not look impressive in the opening half hour but Parejo deservedly levelled from the spot after Pepe fouled Andre Gomes. Once Real went down to 10 men, Neville made some changes, bringing on Rodrigo, who headed a cross into the path of Alcacer to equalise. Negredo, another substitute, should have sealed a famous win when Alcacer found him in space deep into injury time but he was denied by Navas and Gomes put the rebound wide. After the game, Neville insisted he wanted to remain at Valencia beyond his six-month contract and said his claim he did not see himself in management long term had been misunderstood. It appears that Real boss Rafael Benitez is more popular among Valencia fans than his own. Home supporters unfurled a banner thanking him for a spell in charge that yielded two La Liga titles earlier in the millennium. Benitez was named Madrid boss in the summer, but they sit four points off city rivals Atletico at the top of La Liga and two behind Barcelona, who have a game in hand. Benitez appeared to anger goalscorer Benzema when replacing him with winger Lucas Vazquez two minutes before Kovacic was dismissed for hacking down Joao Cancelo. Although they looked like they were going to win it when Bale headed home before Alcacer's quickfire equaliser, Madrid did nowhere near enough to deserve a victory. Gareth Bale has scored more headed goals than any other player in La Liga this season (four). Toni Kroos completed more passes with 100% of accuracy than any other player in a La Liga game this season (80/80). Valencia have gone 21 league home games without a loss, their best undefeated run at home since October 1990 (22). Karim Benzema has scored more goals than any other French player in the top five European leagues this season (12). Cristiano Ronaldo has had a hand in 18 goals in his last eight games (12 goals, six assists, all competitions). Match ends, Valencia CF 2, Real Madrid 2. Second Half ends, Valencia CF 2, Real Madrid 2. Attempt missed. Gareth Bale (Real Madrid) left footed shot from the left side of the box is too high. Assisted by Luka Modric following a fast break. Attempt missed. André Gomes (Valencia CF) right footed shot from outside the box is close, but misses to the left following a fast break. Attempt saved. Álvaro Negredo (Valencia CF) left footed shot from outside the box is saved in the centre of the goal. Assisted by Paco Alcácer. Corner, Real Madrid. Conceded by Danilo. Corner, Real Madrid. Conceded by Aderlan Santos. Attempt blocked. Marcelo (Real Madrid) left footed shot from a difficult angle on the left is blocked. Foul by André Gomes (Valencia CF). Jaume (Valencia CF) wins a free kick in the defensive half. Foul by Danilo (Valencia CF). Substitution, Valencia CF. Javi Fuego replaces Rodrigo de Paul. Pepe (Real Madrid) wins a free kick in the attacking half. Foul by Rodrigo de Paul (Valencia CF). Foul by Álvaro Negredo (Valencia CF). Offside, Real Madrid. Marcelo tries a through ball, but Cristiano Ronaldo is caught offside. Substitution, Valencia CF. Álvaro Negredo replaces Daniel Parejo because of an injury. Goal! Valencia CF 2, Real Madrid 2. Paco Alcácer (Valencia CF) header from very close range to the bottom right corner. Assisted by Rodrigo with a headed pass. Goal! Valencia CF 1, Real Madrid 2. Gareth Bale (Real Madrid) header from the centre of the box to the top left corner. Assisted by Toni Kroos with a cross following a set piece situation. Substitution, Valencia CF. Rodrigo replaces Lucas Orban because of an injury. Corner, Real Madrid. Conceded by Lucas Orban. Hand ball by André Gomes (Valencia CF). Attempt saved. Luka Modric (Real Madrid) right footed shot from outside the box is saved in the bottom left corner. Assisted by Cristiano Ronaldo. Foul by Antonio Barragán (Valencia CF). André Gomes (Valencia CF) wins a free kick on the right wing.